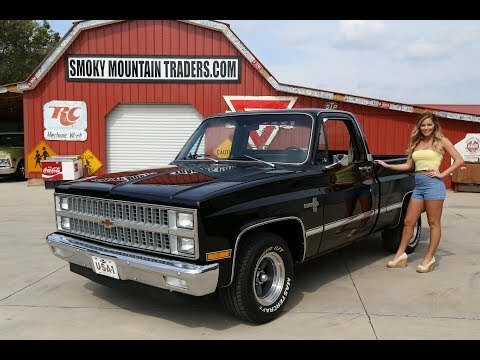 Up for sale we have a 1981 Chevrolet C10 Silverado. This truck has had a beautiful frame off restoration. We will start off with the exterior of this C10. There's no denying this is one of the nicest '81 Pick Ups in the country. From the moment you walk up on it you can see the body is rock solid with excellent panel fit and gorgeous body lines. All the gaps at the doors and bed are as close to perfect as you can ask for on one of these Chevy's. This truck has been redone in the factory Midnight Black color scheme and is slick as a ribbon and is accented by the Silverado Trim Package. All of the Chrome and Stainless on this truck is like new along with the Glass. Inside the bed it's painted, polished, and all appears rock solid. To finish off the exterior look it's sitting on a set of 15” Americans with White Letter Avenger GT Tires. Next, we will look at the interior of this '81. On the inside it's also done in the factory color black color combination. Everything looks like it's new off the showroom floor. The seat covers, door panels, carpet and headliner are all amazing. This C10 does come with the Power Window and Power Door locks. You'll also notice that the dome light is working and that it has factory AC. All of gauges are in excellent condition and are working down to the clock. It has the factory style steering wheel and the dash pad is also in great condition. Finally, we will get to the heartbeat of this Chevrolet. Under the hood it's been upgraded with he 400 Small Block engine that's mated to the 700R Trans and the 12 Bolt Rear End with around a 2.56 Gear. To go along with the Air Condition it also has Power Steering and Power Brakes with Disc on the front and Drums on the rear. Everything in the engine bay has a beautiful detail and the Engine is dressed in the Finned Valve Covers and Breather. For exhaust it has Headers with Dual Pipes and the Hushmaster Mufflers. When you look under this C10 you're sure to be impressed as it appears to have all the factory floors and frame with it all being in great condition. It was taken off the frame at the time of Restoration and everything was detailed to the max. The gas has been replaced and all of the fuel and brakes lines are in great condition.